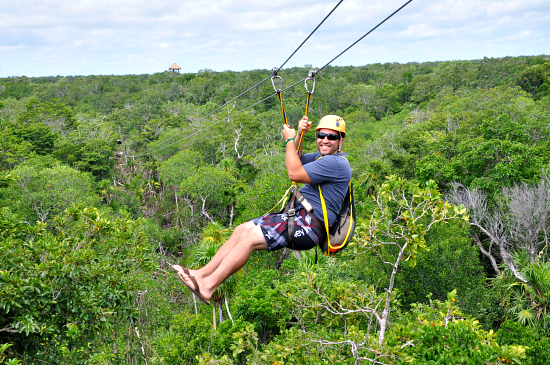 Set out on flight over the jungle’s foliage and cenotes on a series of the most exciting zip-lines of southern Mexico. Take a bike journey through jungle paths and visit local plantations and their diverse cultivations. Explore an extraordinary system of cenotes while swimming and snorkeling in their crystalline waters. Be a witness of and participate in a traditional Mayan purification ceremony in the mystic cenote of the legendary Aluxes. Arrival at Bike Station. From here we enjoy a leisurely 1.6 km/1mile bike tour through the jungle and farmland of Don Silvano. Cenote Xta-Bay: swim and learn about the fauna and flora particular to cenotes, ecosystem functioning and the value of cenotes within local ecotourism. Cenote Chikin-Ha: Snorkel, swim and learn about the geological formation of cenotes, the scientific study of cenotes and speleo-diving. Cenote Aluxes: witness a Mayan purification ritual and learn about the religious significance of cenotes in ancient and current Mayan culture. Zip Line. The first zip-line hangs over the first cenote, 60 meters long, so you can fly over this beautiful area enjoying from the air. The second hangs in the jungle between the first and second cenotes, again 60 meters long but this time with a little more inclination and therefore a little faster. The third zip-line will leave you breathless! Leaving the third cenote you can climb our 17-meter high tower and launch yourself off of it to fly 160 meters above the forest canopy! Lunch and drinks. Afterward return to Bike Station. End of the expedition. Departure for Playa del Carmen or Cancun. Transportation in air-conditioned van, all day multilingual adventure guide, Mayan guides at locations, entrance fee to Chikin-Ha, zip-line and snorkel gear, bicycles, lunch and drinks. Bring comfortable footwear to walk in the jungle, swimming gear, extra T-shirt, towel, camera and extra cash (tips, pictures and souvenirs). This expedition is not recommended for people with severe back problems, any severe physical or motor handicap, serious heart problems, or for obese people or for those who suffer from claustrophobia or do not know how to swim. Children under 6 years, pregnant women and people under the effects of alcohol or drugs will not be permitted to participate in this expedition.